CARFAX One-Owner. Clean CARFAX. Glacier White 2017 Nissan Frontier Desert Runner RWD 5-Speed Automatic with Overdrive 4.0L V6 DOHC One Owner, Clean Carfax, Passed Dealer Inspection, Non-Smoker, Local Trade, Bed Liner, Bed Liner/Trailer Hitch Package, Trailer Hitch (PIO). To be an award-winning dealership, customer care must be a top priority, and here at San Marcos Toyota, it is. Our family-owned and -operated Toyota dealership in San Marcos, TX, has served Hill Country drivers for 18 years and has delivered the transparency, excellence and efficiency needed for an unmatched dealership experience. Recent Arrival! CARFAX One-Owner. Clean CARFAX. Summit White 2018 Chevrolet Suburban LT RWD 6-Speed Automatic Electronic with Overdrive V8 One Owner, Clean Carfax, Blind Spot Monitor, Passed Dealer Inspection, Non-Smoker, 4-Wheel Antilock Disc Brakes, ABS brakes, Compass, Electronic Stability Control, Front dual zone A/C, Heated door mirrors, Heated Front Reclining Bucket Seats, Heated front seats, Illuminated entry, Low tire pressure warning, Navigation System, Power Liftgate, Power-Adjustable Accelerator & Brake Pedals, Remote keyless entry, Traction control. To be an award-winning dealership, customer care must be a top priority, and here at San Marcos Toyota, it is. Our family-owned and -operated Toyota dealership in San Marcos, TX, has served Hill Country drivers for 18 years and has delivered the transparency, excellence and efficiency needed for an unmatched dealership experience. Recent Arrival! For an impressive selection of used cars, come to our Toyota dealership in San Marcos, TX. Our San Marcos Toyota dealership sells used cars under $10,000, along with a variety of pre-owned vehicles that range in make and model. If you’re looking to buy a used Toyota, come test-drive a pre-owned Toyota RAV4 SUV or a used Toyota Camry sedan. You can easily finance a used Toyota truck like the Tacoma or Tundra, or buy a pre-owned Toyota Prius and reduce your carbon footprint. Be sure to view our Certified Pre-Owned Toyota inventory, too, to find the CPO Toyota C-HR or CPO Toyota Corolla that’s right for you. 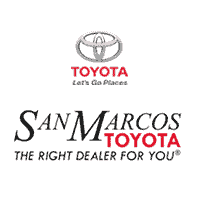 Visit San Marcos Toyota today and buy a used car!